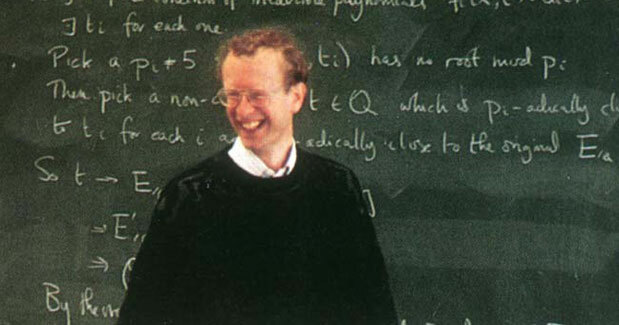 Andrew Wiles is still a living legend who made great contributions to the Mathematical Society; one of his greatest achievements includes his successful attempt to prove Fermat’s Last Theorem. He is at present a Royal Society Research Professor at Oxford University. The British Mathematician Andrew Wiles was born on 11th April 1953; he is the son of Maurice Frank Wiles and Patricia Wiles. His father was Regius Professor of Divinity at the University of Oxford, he also worked as Chaplain at Ridgley Hall, Cambridge from 1952-55. This is probably why Wiles was born in Cambridge and attended The King’s College School and The Leys School, which were both located in Cambridge. He is married to Nada Canaan Wiles who earned her PhD from Princeton University (New Jersey). They have three daughters named, Clare, Kate and Olivia. Andrew Wiles resides in Oxford. His mathematical research was somewhat mentored or assisted by John Coates, together they utilized the methods of the Iwasawa Theory to work on the arithmetic of elliptic curves with complex multiplication. He also had experience working with Barry Mazur regarding rational numbers. Wiles is known to be quite an intelligent mathematician, due to the fact that he uncovered Fermat’s Last Theorem when he was only 10 years old. It is fascinating that such a young boy was able to comprehend mathematical intricacies as such. He continued the idea of proving the Theorem in 1986, once when Ribet had already proven Serre’s ε-conjecture and as a result formulated a connection between Fermat’s Last theorem and Taniyama-Shimura conjecture. Andrew Wiles presented this idea in 1993 publicly in a conference at Cambridge, but there was a shortcoming within the proof, then with the help of his ex-student, Richard Taylor, in 1994 he was able to fully support the proof which was published in Annals of Mathematics. This proof resulted in him becoming quite popular and to suggest this he is a foreign member of the United States National Academy of Science, hence the man became a international mathematical legend. In 1974, Andrew Wiles gained his Bachelor’s degree in Mathematics; he studied at Merton College (Oxford). He also carried out a research at Clare College, Cambridge and finally got his PhD in 1980. He stayed at The Institute for Advanced Studies at New Jersey in 1981 and later on became a Professor at Princeton University. Apart from these academic preoccupations, he was also a Guggenheim Fellow at Intitut des Hautes Etudes Scientifiques (1985-86) and at the Ecole Normale Superieure.